A rough fescue grassland undergoing invasion by smooth brome in southern Saskatchewan. My current research focuses on microbial interactions along plant invasion gradients and in naturally- and anthropogenically-disturbed areas. Using data from novel plant diversity assays and high-throughput DNA sequencing, I track active ecologically active microbial communities and determine who interacts with who in polar desert frost boils, grasslands, and hydrocarbon contaminated sites. Results of this, and other research suggest understanding belowground processes and interactions are paramount to elucidating mechanistic processes underlying aboveground vegetation patterns. Key collaborators: Drs. Steven Siciliano, Bobbi Helgason, and Eric Lamb, University of Saskatchewan. A weather station in the western Mackenzie Mountains, NWT. 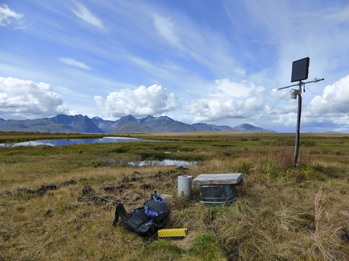 Here I record above- and below-ground conditions to help understand permafrost thaw. I have been co-principle investigator of the Climate Change at the Arctic’s Edge Earthwatch Expedition since 2013. My aim is to build on past and concurrent studies of vegetation and permafrost at treeline in order to provide baseline conditions to which I can compare recent, rapid climatic changes to permafrost dynamics. Specifically, I am committed to extending existing long-term field observations of present permafrost/active layer and boundary layer thermal regimes at Churchill, Manitoba (2000-present), and Macmillan Pass, Northwest Territories (1990-present). These records are essential for detection of the terrestrial climate signal in permafrost and its spatiotemporal variability. Results of my research will significantly improve our understanding of factors that determine treeline pattern and process; information that is essential for developing coupled physical-ecological models to predict future responses of the treeline ecotone to environmental change. Key collaborators: Dr. LeeAnn Fishback, Churchill Northern Studies Centre; Wapusk National Park; Dr. Karen Harper, Dalhousie University. 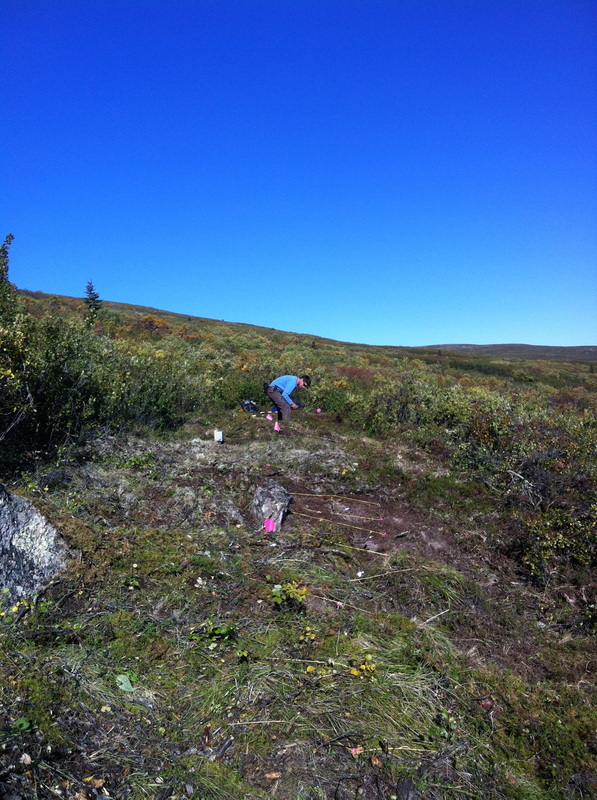 Seeding G-TREE plots near Whitehorse, Yukon. I have co-founded a globally distributed collaborative project aimed at testing the generality of mechanisms driving treeline position: the Global Treeline Range Expansion Experiment (G-TREE). Global research networks, in which standardized local experimentation efforts are aggregated across many sites, have made unparalleled contributions to understanding complex ecological problems, while being feasible even with a limited budget. Initiation of G-TREE has developed from my experiences contributing to a circumpolar synthesis of data on reproductive potential of treeline forest stands for range expansion. The data were collected as part of the International Polar Year (IPY) project PPSArctic (http://ppsarctic.nina.no), which I contributed to during my doctoral research. The results of this research has both filled a knowledge gap regarding individual trees’ ability to reproduce at treeline, and also revealed a lack of understanding of suitability of seedbeds within and beyond current treeline at our sites. Key collaborators: Dr. Carissa Brown, Memorial University of Newfoundland; Dr. Jill Johnstone, University of Saskatchewan; Dr. Andrew Trant, University of Waterloo. 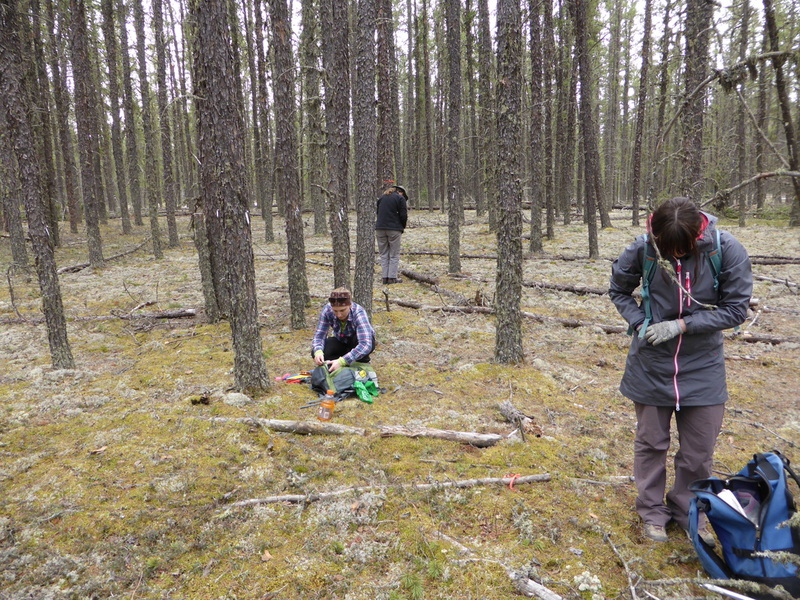 Sampling soil and tree rings in a jack pine stand north of Prince Albert, Saskatchewan. Given recent declines in productivity and tree survival, and marked potential feedbacks such as biome shift and increased fire frequency, there is a clear need to improve our understanding of the interactions between climate, hydrology, and vegetation in the southern boreal forest. I used early warning signals (EWS) in tree ring data to anticipate tree mortality in jack pine (Pinus banksiana)—an extensive and dominant species occurring across the moisture-limited southern boreal forest. I found that trees were less likely to die in intermediate soil moisture regimes and that ring-width chronologies offer considerable potential for detecting when a critical transition in tree growth (i.e., growth reduction) is approaching prior to premature mortality. Ongoing work will also include isotopic analysis of tree rings and stem water contents in order to determine origins of water uptake by trees (e.g., tightly bound soil water versus mobile water provided through precipitation) and how subsurface moisture availability can mitigate drought induced reductions in ecosystem productivity. Key collaborators: Dr. Jill Johnstone, University of Saskatchewan; Dr. Kwok (Sun) Chun, Hong Kong Baptist University; Dr. Juha Metsaranta, Canadian Forest Service. Dr. Alan Barr, Environment Canada.